Reference this essay: Barber, John F. “Martians, Moustaches, and Radio Drama: A Case Study for Sound Art Curation by Re-Creation.”In Sound Curating, eds. Lanfranco Aceti, James Bulley, John Drever, and Ozden Sahin. Cambridge, MA: LEA / MIT Press. 2018. The author describes his curation of historic radio dramas by re-creating them before live audiences. A case study of a re-created performance, the 1938 radio dramatization The War of the Worlds, is at the center of the essay, surrounded by a theoretical framework and discussion. This essay concludes that curation by re-creation provides a full, rich, engaging experience with historic radio drama by communicating ideas about its creation and consumption through the medium of its exhibition. The term “radio art” speaks to creative practice exploring the potential for radio as a medium for art. Radio art seeks opportunities to create and sustain new, experimental acoustic narrative strategies and to subvert the radio medium as a transmission channel for commerce or control. Conversely, “radio drama,” names a specific use of the radio medium, often characterized by scripted dialogue, music, and sound effects, coupled with listeners’ imagination, to create powerful sound-based narrative and storytelling that is broadcast to listeners, and often supported by commercial sponsors. At one time in the history of American radio, art and drama intersected and directly influenced one another. From the 1930s to the early 1950s, radio was the primary form of home entertainment for many listeners across the country. For a brief period within these three decades, two radio series consciously tried to combine radio art and drama. Their results were some of the most popular radio dramatic episodes of the time. More on this shortly. Just now, let us continue to consider connections between radio art and radio drama. Both rely on the technology, practice, and culture of radio for their production, distribution, and consumption. Both are ephemeral, disappearing soon after their broadcast, unless they are preserved as recordings. Recorded episodes of a great number of radio drama series are accessible via traditional broadcast and online radio stations, or can be downloaded from websites. As historical artifacts, and perhaps all that remains of the creative and commercial practices associated with their original making, these recordings provide important information and listening opportunities regarding the overlay of radio art and radio drama. But, recordings do not provide a direct listening experience of the values invested in the original performance. Neither do they address the passage of time and changing cultural attitudes and how they may effect what is heard and understood as we listen again. In this sense, recordings provide a bracketed, incomplete listening experience. As someone interested in curating radio art and radio drama, this seems an interesting challenge. In response, I have developed what I call curation by re-creation where I explore providing a fuller, richer, more engaging experience with radio drama through its creative performance for live audiences. These re-creations foreground the radio art behind the radio dramas. This essay recounts efforts associated with my re-creation of The War of the Worlds radio drama on the seventy fifth anniversary of its original broadcast, 30 October 1938. This particular radio drama is perhaps most exemplary of the overlay of radio art and radio drama. I contextualize my efforts by first outlining an overarching conceptual framework, situating curation by re-creation as a practice designed to more fully engage the listening audience with live performance of the radio drama than might be possible through listening to a recording. Next, I discuss my efforts to re-create the War of the Worlds radio broadcast, combining and connecting the performance with a variety of curated information opportunities to prompt listener engagement. In conclusion, I argue that curation by re-creation promotes opportunities for engagement with radio drama not available via more traditional curatorial venues or approaches, as well as providing a system for dissemination and communication more effective than might be possible through a historic recording. “[M]ost of us live immersed in a world of sound,” says Bruce R. Smith. “Sound is at once the most forceful stimulus that human beings experience, and the most evanescent.”  The latter statement creates a particular challenge in the curation of radio art and drama, because sound disappears quickly and can be lost. As Smith goes on to note, in many cases, historical literature provides our only access to sounds that are no longer available for direct listening. Despite these problems, documentation, migration, and emulation may be useful for curating radio drama. For example, recordings of sound-based radio dramas can provided documentation of original broadcasts. However, these recordings are bracketed, set apart, separate from their original context and provide only partial narratives regarding their creation and consumption. Might a combination of documentation, migration, and emulation promote opportunities for listeners to engage with the sounds of radio dramas, as well as provide contextual information regarding the space and time of their original creation? To achieve these goals, extrapolating from Banovich and Tribe, a curator of sounds may provide information about the historical, social, and cultural considerations of the time and place for their original production. She may provide information or activities regarding their process(es) of production, distribution, reception, as well as changing interpretations fostered by the passage of time. And, she may provide opportunities to experience the ability of curated sound objects to convey information and explication along with meaning(s) and importance. I have used this conceptual framework as a curatorial model for the re-creation of radio dramas from the 1930s-1950s. During this period, across the country, families gathered around their radio sets to hear their favorite programs, each arriving, as if by magic, though the air. Radio drama was especially popular, and listeners enjoyed a wide range of genres: adventure, crime, horror, mystery, noir, science fiction, and experimental. Two radio drama series were exemplary: The Columbia Workshop and The Mercury Theatre on the Air. Both are noted for their efforts to experiment with the radio medium in their efforts to produce and broadcast the finest examples of radio drama possible. In this regard, both series represent perhaps the finest results from combining radio art and drama. The ability of radio drama to inspire imagination through sound-based narratives, and the ability of radio art to contextualize and communicate these narratives, interests me as a curator. To achieve curatorial goals noted earlier by Banovich and Tribe, I have developed a practice I call curation by re-creation. I believe it a methodology for curating radio art and drama so participants can better experience the conditions under which the original sounds were created, and knowing that, engage with them more deeply in the present time. I frame curation by re-creation as a methodology distinct from curating new works by an artist. For me, the “work,” the radio drama, already exists. I retain this original as the core of my practice, while re-creating it in a different context. With curation by re-creation I am following Tribe’s suggested curatorial strategies: documentation, migration, and emulation. Specifically, by providing historical and background information, I am documenting the context of the original broadcast of selected radio dramas. I am migrating these examples from archival repositories to active listening contexts. And, I am emulating, admittedly to an imprecise degree, the sonic potentiality of their original broadcast and listening experience. Finally, with curation by re-creation, I seek to shift listeners from the original to a current context so to both entertain and educate regarding what they are hearing, and how it was first created as an art form. In this effort, I draw from John Berger who, following the earlier work by Walter Benjamin regarding mechanical reproduction of original works of art, notes that visual cues accompanying any image provide historical information about beauty, truth, form—all of which may change from the context of original creation to current consumption. In short, our ways of seeing, may change as we ourselves change. Is it unreasonable to extend this idea from seeing to listening? Listening to a recorded radio drama, we may have no cues as to the original source of the art we experience, the process of its creation, or why we might accept it as a reality in which we are a participatory agent. Curation by re-creation may provide a solution. My process is a laying on of visual and aural cues. I begin with a 1936 movie theatre where one might expect to see projected visual images. There, I re-enact historic radio dramas complete with voice actors and Foley sound artists. Visual images are projected on the screen behind the actors, providing a backdrop for their performance. Digital sound effects and music, most often recorded but sometimes live, are also part of the performance. A live audience watches and listens. Following a link provided in the program, audience members can learn more about the history and impact of each drama through an information website. Dedicated Facebook and Twitter links are also provided. Audience members are encouraged to share their experiences via these and other social media platforms throughout each performance. The result: radio drama as never before heard, or seen. I believe removing the unseen, unknown nature of a recorded historic radio broadcast, and prompting the audience through visual cues to re-imagine the time, context, and source of the sounds they are hearing. 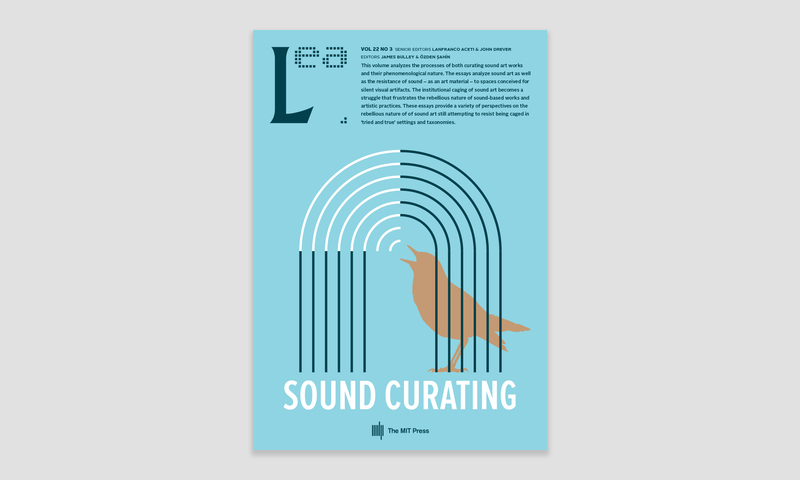 This provides a pragmatic approach to curating sound art , one where participants can more fully experience the power of sound to convey engagement and agency. To test this belief, in 2013, on the seventy-fifth anniversary of its original broadcast (30 October 1938), I re-created The War of the Worlds, noted at the time for creating mass hysteria among listeners and still considered one of the most famous radio dramas of all time, as well as an exemplary example of radio art. The radio broadcast begins with the novel, The War of the Worlds, by H. G. Wells (1866-1946). Wells’ science fiction novel was serialized in nine-parts in Pearson’s Magazine beginning in 1897. The complete edition of the novel was first published in February 1898 by William Heinemann of London and has since remained constantly in print. The novel describes the invasion of Southern England by Martians through the observations of an unnamed narrator and his brother (also unnamed). After devastating the countryside and London, the Martians are themselves conquered by common Earth bacteria to which they have no immunity. The War of the Worlds is often cited as an example of invasion literature, a genre that became popular in England and Europe in the years leading up to World War I. Invasion literature is noted for its attention to international disputes, the nationality of the invaders, and the military ability of the invaded country to repel them. The War of the Worlds adds an additional layer with its invading army coming not from another country, but from another world. Where would they come from? What technologies would they have? What defenses would humans have against such an invasion? Wells’ novel is one of the first publications to detail conflict between humans and extraterrestrials, and his answers to these questions were, at the time, sophisticated and visionary. Even today, they remain thought provoking. Wells’ novel, The War of the Worlds, is frequently commented upon and has influenced the production of dozens of feature films, television programs, sequels, adaptations, and a radio broadcast of some repute . The War of the Worlds radio broadcast, was the seventeenth episode of The Mercury Theatre on the Air, a weekly radio drama broadcast on the Columbia Broadcasting System (CBS). Orson Welles and his Mercury Theatre had already made a name for themselves producing dramas in New York City. They were invited by CBS to form a radio production company, The Mercury Theatre on the Air, and experiment with the new radio medium as a context for sound-based literature and drama. Adapted from the H. G. Wells’ novel by scriptwriter Howard E. Koch and performed by Orson Welles and cast of The Mercury Theatre on the Air , 30 October 1938, The War of the Worlds radio drama utilized a series of realistic “break in” news announcements to report about Martian metal cylinders falling to Earth and a group of tripod fighting machines wreaking havoc in New Jersey and New York City. Many listeners, hearing the broadcast, believed New York City to be under attack by an invading army from Mars . Newspapers the next day claimed the radio broadcast created panic and confusion. A few observers, however, applauded the effective use of the new radio medium to create a form of dramatic art that was so believable. Even now, more than seventy five years after its original broadcast in 1938, The War of the Worlds radio drama still provides an engaging listening experience . How might a curator share this experience with contemporary audiences outside the traditional museum display or gallery exhibition ? I will attempt to answer this question by describing my efforts to curate the original radio drama broadcast through a re-created performance for a live audience. I chose The War of the Worlds radio drama because I thought it would provide excellent opportunities to answer these questions. I began by teaching students to edit digital sound files and asked them to condense the hour-long radio broadcast into a narrative of ten minutes or less. This edited version would become their base narrative, subject to modification in other media forms. Students were tasked with building a website as a home for their shortened narratives. From there, they could make connections to additional websites, blogs, videos, games, and other forms of digital media selected for their exploration of transmedia storytelling. They were also free to revise, remediate, and/or remix the original narrative however they liked. In keeping with the theme of a radio hoax, one student imagined the break-in news reports of the original radio drama as a clever government cover-up,. The Martian landings were real, but by being disguised as drama they were perceived as a hoax. She expanded her narrative through the use of digital video focusing on extraterrestrial arrivals, a series of updates via different forms of social media, and an online video game where one could learn more about the Martians by achieving higher and higher levels of information access. Another student envisioned Martians as having long lived among humans, either hidden or disguised with, perhaps, moustaches. In order to show their presence around us, she used augmented reality, creating a series of posters which, when scanned by mobile devices running appropriate software, displayed underlying videos or images showing the aliens as embedded throughout our culture and its practices. A third student was dismayed that reporter Carl Phillips died in the first Martian heat ray blast at Grover’s Mill, New Jersey. He had Phillips survive the deadly ray by hiding behind a rock wall and then continue reporting about the Martians, but through the use of the social media platform Twitter rather than radio. His website was designed to introduce Phillips’ “tweets” periodically, and seemingly anonymously. Midway through the course, excited about their projects, students wanted to share their creative efforts with others. As a group we connected with a local gallery, established dates, 3 0 October—30 November 2013, and set about developing our exhibition. Each student was responsible for curating his or her own work. I provided an overall conceptual statement regarding the collection of works. Based on the narrative of one student about aliens living among us, disguised, we chose the title for the exhibition, “Martians with Moustaches,” as a nod to both the idea of disguise and an effective marketing hook. Each work in the student exhibition incorporated a small portion of the original radio broadcast, but would this be sufficient to provide an understanding of the whole? As Gabriele Proy notes, “to record a sound is always to separate it from the context in which it was born. This separation seems to be a fundamental reduction on the one hand, but on the other it opens many possibilities for superimposing former meanings and new correlations and significances .”  How to foreground the original radio broadcast as the focus of our contemporary work? And how to do this so to facilitate careful listening? Enterprising curators, I reasoned , would draw from diverse resources to accomplish their objectives. I had previous connections with a group of voice and Foley artists known as the Willamette Radio Workshop. The War of the Worlds was in their repertoire. Why not engage them to re-create the original radio broadcast as a live event where the audience could see and hear the actors and artists behind the broadcast? Would removing the unseen nature of the radio broadcast, and allowing the audience to see the source of the sounds they were hearing, provide a more rewarding understanding of how the production of a radio drama actually worked? The Willamette Radio Workshop was eager to proceed, but what venue would provide sufficient opportunities to realize our goals and objectives? The historic Kiggins Theatre, established in 1936, two years prior to the original radio broadcast, was just next to our gallery space. The manager confirmed the theatre would be available if we would handle the promotion and assure sufficient sales at the concession counter to pay the salaries of those employees working the night of our performance. The performance exceeded all expectations for success. More than three hundred people attended, many dressed in Halloween costumes. It was the night before Halloween, after all! For those without costumes, we provided assorted stick-on moustaches. Two persons in the audience remembered hearing the original radio broadcast in 1938. We awarded them certificates and honorary moustaches. The broadcast re-creation began with a short video of respected journalist Edward R. Murrow explaining the context in which the original radio broadcast was first heard. Then, with images projected on the screen behind them, the voice actors delivered their lines while Foley artists worked their magic with improbable objects like boxing gloves, ratchet wrenches, and balloons filled with dried peas to create the sound effects that lend such realism to this radio drama. As a result, the audience experienced, firsthand, the cleverness of the radio drama form, the virtuosity needed for its performance, and how the mechanics of the original production might have worked. In short, the audience was able to experience the radio art associated with this radio drama. After the performance many walked next door to view the student exhibition. I have discussed my efforts to curate radio drama through its re-creation as creative performance for live audiences. This discussion has been both general, with regard to my conceptual framework for this curatorial practice, and specific, by way of description of re-creating The War of the Worlds radio drama on the seventy-fifth anniversary of its original broadcast, in1938. I find further support in Charles Smith who says objects in museum collections may be displayed in different ways, each “a system of theatrical artifice. The best museum displays are often those that are most evidently self-conscious, heightening the spectator’s awareness of the means of representation, involving the spectator in the process of display.”  I am applying all these perspectives, Smith, Wollen, Dziekan, and Proy’s, to an audio-visual context, when I re-create radio dramas as performances before live audiences. The audiences, in turn, are not listening abstractedly. Rather they are using their previous experience with narrative and text and sound and music from across their lives to bring meaning to this experience. I believe curation by re-creation serves as contextual exhibition of a combination of radio art and radio drama. And, following Banovich, this approach provides ways and means to communicate ideas associated with curated objects through the medium of their exhibition. People learn about radio drama by listening to re-created examples. This, in turn, provides opportunities for public outreach, sharing, and scholarship. In response, I describe a practice I call curation by re-creation, where I take a specific form (radio drama) and apply physical display-based methodology by performing examples before live audiences in a theatre space. As a case study, I recounted my efforts to curate by re-creating the 1938 radio dramatization by Orson Welles and the Mercury Theatre on the Air of H.G. Wells’ novel The War of the Worlds . Implicit in my discussion was the admission that I objectified this re-creation through decisions regarding the performance, the venue, and the associated historical and curatorial information associated with this effort. In conclusion, I suggest curation of radio art and/or drama through re-creation for live audiences provides opportunities for engagement with curated sound artifacts not available via more traditional curatorial venues or approaches. For example, it provides knowledge of context, understanding of the historical, social, and cultural considerations of the time and place for the production of the original sound(s). And, there is increased opportunity for audiences to appreciate the process(es) of their production, distribution, and reception. Curation by re-creation augmented with curatorial information and activities positions the ephemeral aural experience in relation to changing interpretations fostered by the passage of time. As a result, listeners are better able to appreciate and experience the ability of sounds to provide information and explication , to promote engagement with believable narratives. With curation by re-creation, radio art and/or radio drama can be both a curated and interactive activity, archived yet constantly in play (literally and figuratively), continually curated by re-creation. John F. Barber teaches in the Creative Media & Digital Culture program at Washington State University Vancouver, where his research, teaching, and creative practices focus on radio and sound. His radio and sound art work has been broadcast internationally, and featured in juried exhibitions in America, Canada, Germany, Macedonia, Northern Ireland, and Portugal. Bruce R. Smith, “Tuning into London c. 1600,” in The Auditory Culture Reader, eds. Michael Bull and Les Back (Oxford, UK: Berg, 2003), 127-135 and 127, 128. See also Richard Cullen Rath, How Early America Sounded (Ithaca, NY: Cornell University Press, 2003), which focuses on how people heard their worlds in early America and provides a step toward understanding what is meant by aural history. A more definitive introduction is Hearing History: A Reader, edited by Mark M. Smith (Athens: The University of Georgia Press, 2004). For a fine history of sound, see Jonathan Sterne’s The Audible Past: Cultural Origins of Sound Reproduction, (Durham, NC: Duke University Press, 2003). Mark Tribe, in Curating New Media: The Third Baltic International Seminar, eds. Sarah Cook, Beryl Graham, and Sarah Martin (Gateshead, UK: BALTIC Centre for Contemporary Art, 2002), 142-143. Tamas Banovich, in Curating New Media: The Third Baltic International Seminar, eds. Sarah Cook, Beryl Graham, and Sarah Martin (Gateshead, UK: BALTIC Centre for Contemporary Art, 2002), 47. Audio file of presentation available online at http://balticplus.uk/digital-archive/?search=curating+new+media (accessed February 2015). Mark Tribe, in Curating New Media: The Third Baltic International Seminar, eds. Sarah Cook, Beryl Graham, and Sarah Martin (Gateshead, UK: BALTIC Centre for Contemporary Art, 2002), 148. John Berger. Ways of Seeing. (London: Penguin Books, 1973). H. G. Wells, The War of the Worlds (London: William Heinemann, 1898). Percival Lowell, Mars (Boston, MA: Houghton Mifflin, 1895). H. G. Wells, “Intelligence on Mars,” Saturday Review 81 (4 April 1896): 345-346. The Martians traveled to Earth in metal cylinders, a technology proposed in 1865 by Jules Verne in From the Earth to the Moon (London: Sampson Low, Marston, Low, and Searle, 1873), first published in French as two volumes: De la Terre a la Lune in 1865, and Autour de la Lune in 1870. Scientific and technological advancements prior to and just after the publication of Wells’ novel include aspirin, bicycle, carbon paper, Darwin’s evolution theory, ether, flash photography, genetics, hypodermic syringe, incandescent lamp, linoleum, motion pictures, nitroglycerine, pneumatic drill, steam locomotive, transatlantic cable, uranium, vulcanization of rubber, and X-rays. Additionally, listen to Radio Lab: War of the Worlds at the Radio Lab website: http://www.radiolab.org/2008/mar/24/. Scroll down the page and listen to “The Annotated Guide” as well. Both provide great insights into how and why The War of the Worlds was so effective, or controversial, depending on to whom you talk. Orson Welles, The War of the Worlds, dir. Orson Welles, from a novel by H. G. Welles, script by Howard E. Koch, The Mercury Theatre on the Air (October 30, 1938). In 1938, America faced the prospect of another war in Europe and was fearful for its security. Many people listening to The War of the Worlds radio broadcast thought the East Coast of the United States was under invasion by the Nazi German military, not Martians, that war had come to the shores of America. For more about transmedia storytelling, see Henry Jenkins, “Convergence? I Diverge” (http://web.mit.edu/cms/People/henry3/converge.pdf), “Convergence Culture Slideshow” (http://www.slideshare.net/Mediaprodshj/convergence-culture-henry-jenkins), and “Transmedia Messionaris: Henry Jenkins” (http://www.youtube.com/watch?v=bhGBfuyN5gg). Gabriele Proy, “Waldviertel: A Soundscape Composition,” in Art of Immersive Soundscapes, eds. Pauline Minevich and Ellen Waterman (Regina, Saskatchewan: University of Regina Press, 2013), 90, 95. Willamette Radio Workshop, http://www.radiowork.com (accessed 8 February 2015). Kiggins Theatre, http://kigginstheatre.net/ (accessed 8 February 2015). Edward R. Murrow introduced the made-for-television movie The Night America Trembled, which was broadcast live on 9 September 1957. Available online at http://www.youtube.com/watch?v=7jeW30vLwds (accessed February 2015). Peter Wollen, “Introduction,” in Visual Display: Culture Beyond Appearances, eds. Lynne Cooke and Peter Wollen (Seattle, WA: Bay Press, 1995), 9. Vince Dziekan, Virtuality and the Art of Exhibition: Curatorial Design for the Multimedial Museum (Bristol, UK: Intellect, 2012), 34. Charles Saumarez Smith, “Museums, Artefacts, and Meanings,” in The New Museology, ed. Peter Vergo (London: Reaktion Books, 1989), 20. Vince Dziekan, Virtuality and the Art of Exhibition: Curatorial Design for the Multimedial Museum (Bristol, UK: Intellect, 2012), 33. Peter Vergo, “The Reticent Object,” in The New Museology, ed. Peter Vergo (London: Reaktion Books, 1989), 48-49. Sarah Cook, Beryl Graham, and Sarah Martin, eds. Curating New Media: The Third Baltic International Seminar (Manchester, UK: Cornerhouse Publications 2002), 88. Mark Tribe in Curating New Media: The Third Baltic International Seminar, Sarah Cook, Beryl Graham, and Sarah Martin, eds. (Gateshead, UK: BALTIC Centre for Contemporary Art, 2002), 148.